A tournament that signaled the start of a new era in men's tennis! How wonderful was it to see a new champion? Grigor Dimitrov, having beaten Dominic Thiem in the quarter finals took advantage of the injuries to Rafa Nadal, Andy Murray and Novak Djokovic by beating American Jack Sock who was having a great run, in the semis, before then defeating David Goffin, who himself had upset 19 times grand slam champion Roger Federer in the semi finals, to take the title. That is how it could have gone - for that is how the ATP Tour finals in London went at the end of last year - a tournament that could have signaled that finally the lost generation of men's tennis players was taking over. Roger Federer, in a shock to no one except his obsessed fans, who despite his having won 19 grand slam titles previously, always think he is just a few absent minded service games away from losing every match, won the Australian Open title and reached 20 grand slam titles. It is a stunning number of titles. Only Serena Williams and Steffi Graf remain ahead of him among Open Era tennis players with 23 and 22, and Nadal is now again 4 titles behind him among the men. Perhaps the most stunning aspect about it is how by-the-numbers it felt. To be honest, up till the first set of the final, I didn't even think Federer played all that well. He was solid against Gasquet in the 4th round and against Berdych in the QF, but no more than that. The semi final was literally not a contest due to Chung's blisters. The reality was he didn't need to be any better than solid. First gear was enough, with the occasional 2nd gear shift to get a break. Last year however, he was astonishing against Berdych in the 3rd round - perhaps the best he has ever played; he was solid against Misha Zverev in the QF, but in the 4th round, SF and Final he had to bring out every weapon he had to beat Nishikori, Wawrinka and Nadal in 5 sets each. This year until the final against Cilic - a worthy finalist in any year - his progress was rather dull... indeed the men's tournament was pretty dreary. There was a lot of raving about the Kyrgios-Dimitrov 4th round match, but I thought it a match between two guys who don't know what to do with all the shot-making ability they have. It was entertaining in patches, but mostly it was so because both seemed equally fragile when getting in a winning position. Equally the Chung-Djokovic match was absolutely raved about like it was some classic, when for me the first set especially might have been some of the worst tennis I've seen played. Djokovic was clearly barely fit, his serve was awful - he double faulted 7 times! - and yet even though he was well below his best he was able to nearly win the first set despite having been down 4-0 with 2 breaks. None of this really matters, nor even diminishes Federer's achievement - you can only beat who is on the other side of the net - but I think it highlights a big problem with men's tennis at the moment. The depth of men's tennis is very shallow at the moment, and the problem is being covered by popularity and brilliance of Federer and Nadal. The age one first because it is rather bonkers. Had Federer remained on 17 it would have made sense. Winning after you hit 30 is not really the done thing. Mostly you compete, keep the older fans entertained, have a couple good runs to a semi-final, maybe a final, and then if you are very lucky you win one, and then you retire. When Federer won the Wimbledon title in 2012 it had already been 2 and half years since his last slam title. Now during that "drought" he did make every quarter final and reached 5 semi-finals and one final, but it was long enough to think, yep, this was his final one. Well done Roger, off you go, enjoy retirement. And then he kept going. I first wrote about Federer in 2008 after he won the US Open that year. Already at that point the talk was about how long would he go - most assumed he'd try to keep going till the London Olympics, as it would be played at Wimbledon. Back then Federer had just won his 13th title, but was yet to win a French Open. He would go on to win the French the following year and was in the midst of possibly the greatest run of Grand Slam performance anyone has ever done. A run that saw him make the final of 18 out of 19 slams - a number really only Steffi Graf and Martina Navratolova can match - Steffi reached 13 finals in a row from 1987-1990 and Martina reached 22 out of 25 from 1981 to 1987 (the best Djokovic has done is 6 finals in a row, Serena, 4; Nadal 5; Chris Evert is tougher to count because she skipped the Aus Open a lot). So he made 18 out of 19 finals, won 12 of them, and people were talking about his getting to 20 slams. Kevin Mitchell writing in Guardian stated as a mater of fact, "This was Federer's 16th slam. There will be more". Joe Drape in the NY Times pondered, "By winning his fourth Australian Open, Federer may have his best opportunity to join Don Budge (1938) and Rod Laver (1962, ’69) in taking down the sport’s holy grail: a Grand Slam, a sweep of the four major tournaments in the same year." Instead that title marked the end of the era - knocked out in the quarter finals at both the French and Wimbledon and losing in the semi finals to Djokovic, who at that time had won only 1 grand slam title and was about to start his own era. After Federer's win at the US Open in 2012, he would win one more in the next 6 years - in that time Djokovic would win 11 out of 22. 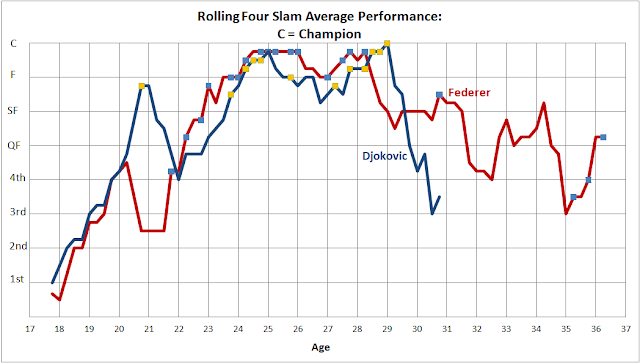 Federer's era ended when he turned 28, Djokovic's when he turned 29. Djokovic's drop-off has been sharper because he suffered injuries, unlike Federer, who did not miss a grand slam until the 2016 French Open, by which time he was already 34 - 4 years older the Djokovic is now. It shows the task ahead of Djokovic. Unless something very odd happens, he is never going to be as dominant as he was when he was from age 24 to 29. But he might be able to be as good - which is what has happened with Federer. Federer is not as dominant, because he'll still get the odd back issue (cf last year's US Open) and he'll generally skip the French Open - he hasn't played it since 2015 and I wonder if the next time he plays that tournament it will be because he is doing a bit of a farewell tour - but he is as good. The weird thing about Federer's past 12 months is how after last year's Australian Open the titles have felt a bit anti-climatic. The Wimbledon win was so by-the-numbers - not dropping a set, not really facing anyone dangerous - Cilic was, but he was so hobbled in the final that is was not a fair fight - that I didn't even bother to write a post about it. And now he has won 20 titles. So what does it all mean? Superlatives aplenty - he probably has the most of any man sewn up. Nadal might get to 20, but no one else. For Djokovic to get to 20 would require not only his getting his game back (a big call, given how awful it was to watch him founder against Chung in the 4th round) but he needs to do so before the younger generation steps up. 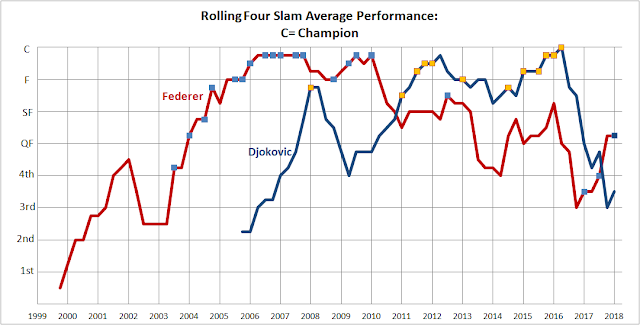 As I always like to point out, Djokovic - and even Nadal - are not really Federer's contemporaries. Fed's peers - Hewitt, Safin, Roddick, bowed out ages ago. He has been playing against younger guys for most of his career now - his Wimbledon win against Roddick was in 2009, since then he has really been playing against Nadal, Djokovic and Murray in their primes, rather than them in his, and those three are among the best three ever to play. For Federer to get to 20 he needed to win a stack before the younger mob - especially Djokovic - worked out how to win. Now the younger gen of Thiem, Kyrgios, Zverev are learning how to win. They haven't really clicked at the slams yet, but it can happen quickly. When Federer won his first slam title he had before that never been past the quarter finals, and Nadal (clay freak that he is) had never even made a quarter final in a slam before he won his first title. Federer and Nadal are really the only two in the contest for greatest male player of the open era - so we can safety assume they are a bit out-of-the-box different. But they have been helped and have also adapted. The technology means Nadal is able to play the way he does for longer than would have been possible with the old racquets and strings. Federer too is not the same player he was when he won Wimbledon in 2012 - he has a bigger racquet and he is playing differently - especially on the backhand. The Federer of 2018 would beat Federer of 2012 - a better backhand, smarter use of serve volley, more attacking return, more emphasis on shorter points rather than stubbornly trying to beat Djokovic, Murray and Nadal at the baseline. And both Nadal and Federer have been helped by injuries (which to be fair, they too have had recently). But let's not put any asterisks on any of these wins. That Djokovic, Murray and Wawrinka may have been injured is irrelevant. You want to win at sport - stay healthy and turn up. Richmond might have been helped by the Crows having Brodie Smith and Mitch McGovern out injured for the grand final, but so what - best team on the day wins. In 2008, Federer had glandular fever when he lost to Djokovic in the semis of the Australian Open - that doesn't diminish Djokovic's victory at all. Life it tough at the pinnacle of sport - tore a hamstring? Got blisters? Pity. So sad. Sorry, someone else gets to win. But the loss of Djokovic, Murray and Warinka to injuries - much like the loss of Federer in 2016, revealed that there is not much else there. Federer, Nadal, Cilic, Wawrinka, Anderson. Just five players. That's not many taking advantage of all the injuries to top players. Dimitrov (SF), Zverev (4th), Thiem (SF - French), Cilic (W), Goffin (QF), Sock (4th). That is not a murderer's row of players. Zverev is young, so he gets a pass, But Dimitrov is now 26 - and should be at or near his peak, Thiem is only 24, but outside of the Paris clay he has not reached a quarter final, Goffin is 27 and as honest a player as you can get but 2 quarter finals in his entire career says it all really, and Sock might one day make a run somewhere, but he is 0-8 against Federer/Nadal and I doubt either of them cared too much whether he ended up in their half of the draw. I could see Dimitrov winning one, Zverev could (will?) win a bundle, Thiem surely will crack it for the French Open (maybe even this year), and Cilic is every chance to add to his US Open title. Djokovic (W), Murray (W), Federer (W), Wawrinka (W), Nadal (W), Berdych (F), Nishikori (F), Ferrer (F). Now that was a line up. And we're a long way from seeing its like. Federer has certainly improved his game - the topspin backhand is a thing of beauty all Federer fans wish he had been using throughout his career given how it has enabled him to beat Nadal 4 times in a row last year. But he is right when he said at the start of the tournament that a 36 year old should not be the favorite. And neither for that matter should Nadal at 31 year old. Where are the 24-28 year olds? Alas that group - led by Dimitrov, Raonic and Nishikori have not been able to snag a slam title - let alone look like reaching number 1. And the lack of real depth has meant Federer and Nadal have been able to grab a couple more titles at an age when they really shouldn't. That Djokovic, Murray and Wawrinka have faltered due to injury/age (call it what you will) is not all that surprising. It is what happens. Usually what happens is the best players get older, drop off and then the new guys come through. It is exactly what happened to Federer. Yes he beat Sampras in the 2001 Wimbledon 4th round, but when he won his first grand slam title at the 2003 Wimbledon, Sampras was retired, and so too were the other best male grass court players, Pat Rafter and Goran Ivanisevic. Agassi was still there, but at 33 would never win another slam and only one more Masters title. Hewitt, Agassi, Carlos Ferrero, Federer, Roddick, Nalbandian, Coria, Shalken. 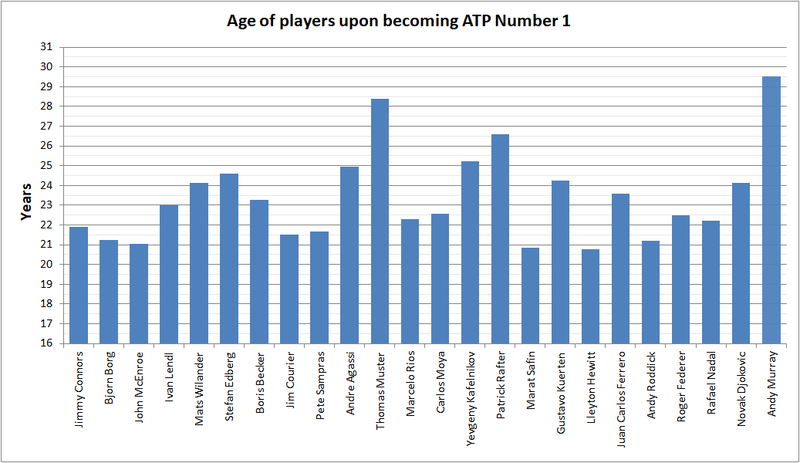 All except Agassi and Shalken were 20-23yo. The time was ripe for a win from the younger brigade - and Federer did, beating Mark Philippoussis who was having his last moment in the sun. But on the way Fedeer beat Lee Hyung-taik (older journeyman), Koubek (older journeyman), Mardy Fish (same age), Feliciano Lopez (same age), Shalken (older better journeyman), Roddick (same age) and then Phillippousis who had taken out Agassi, so was in effect subbing in as the best player from the previous era. 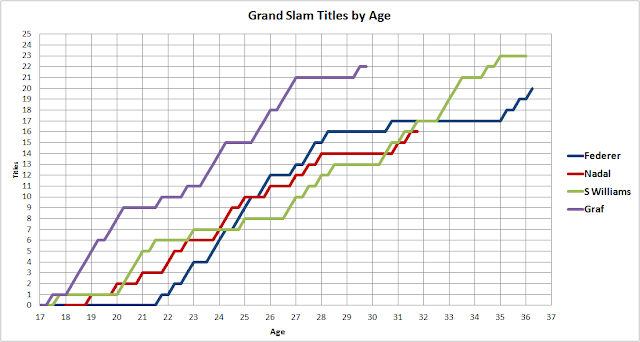 So to win his first title, Federer mostly had to beat his peers and then beat just one of the very good older gang. Now the easy answer as to why the generation of 24-28 year olds has not broken through is that they keep hitting into the older top 4/5 who have stuck around longer and healthier than previous late 20s, early 30s players. Gasquet (3rd rd), Kukushkin (2nd), Federer (3rd), Troicki (1st), Johnson (3rd), Murray (4th), Nadal (SF), Schwartzman (3rd), Federer (4th), Rublev (2nd), Edmund (QF). So yes, out of 11 tournaments he has had to play Federer twice, and Nadal and Murray once. But what about the others? At last year's US Open he came into the event having won his first Masters title at Cincinnati, and then he lost to 19 year old Rublev. You can't blame the older guys for that. Nadal played Rublev in the quarter finals - Rublev won a total of 5 games. Edmund, who he lost to last week in the QF, is younger than he is. This is not to pick on Dimitrov, whom I love to watch play, but at least Milos Raonic has lost to either Murray, Nadal or Federer in 4 of his past 8 grand slam tournaments. There are only 4 players under 25 in the top 20 - Zverev, Thiem, Kyrgios and Pouille. At the grand slams they have 2 semi final and 4 quarter final appearances between them (and the SFs are both Thiem's). 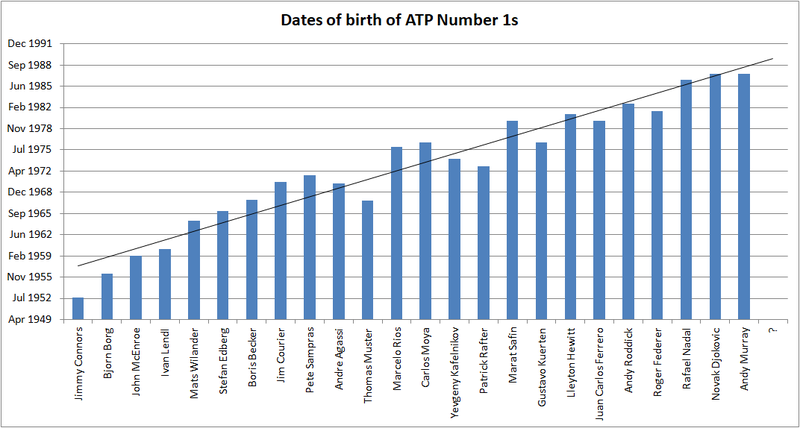 Since Connors reached Number 1 in 1974, there has been a pretty consistent turnover of new Number 1 players in the world - on average going from one player to someone born 18 months after they had been. If that were to follow, the next number 1 would be born around the middle of 1989 - but that would make that player already 29 years old. Connors-Borg, give way to McEnroe-Lendl, who give way to Wilander, Edberg, Becker and on and on. Yes the older guys stick around a bit or some of the younger ones come a bit earlier than others, but pretty much it holds. So we should now be looking for an era of players who were born 4-5 years after Nadal, Djokovic and Murray - players born in 1992-93 - that is 24-26 year olds. Right now there are 4 players aged 24, 25 or 26 in the top 10 - Dimitrov, Thiem, Sock and Carreno-Busta. But there are only 4 more in the rest of the top 50. Federer and Nadal are great players, certainly. But not only are they helped by their great ability, they are also helped by there being a dearth of talent among the players who would normally be peaking right now - it shouldn't be Federer and Nadal who are the ones taking advantage of injuries to Djokovic, Murray and Wawrinka. 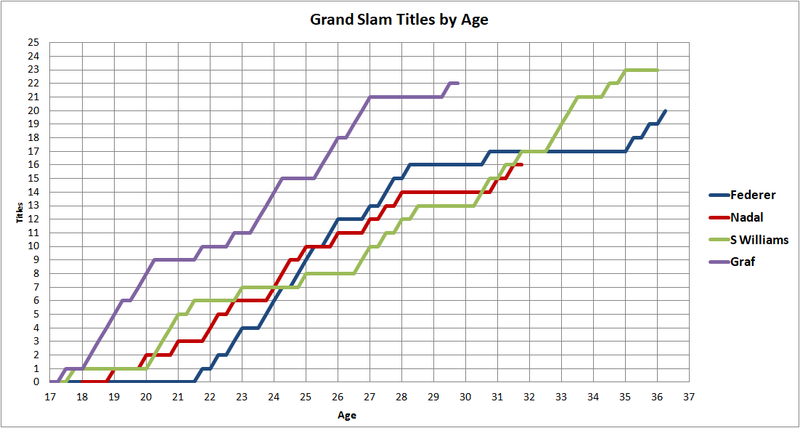 Now maybe that peak will occur at an older age and Dimtrov et al will win a lot of slams from aged 27-30. 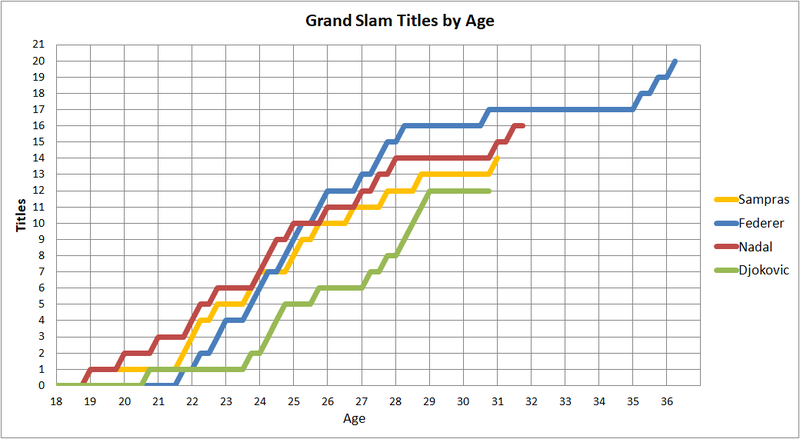 My suspicion however is Kyrgios, Zverev, Chung, Rublev, Shapavolov, Medvedev and others yet to turn 23 will not be so lacking in titles over the next 3 to 4 years. They are young enough not to be thinking "Why oh why did Fed/ Nadal/ Djokovic/ Murray/ Wawrinka have to be around when I was playing? ", instead they are thinking, "Get out of the way, Grandpa." And so Federer's 20th title is a great achievement. It was one which I, as an obscenely obsessive Federer-fan, loved to watch. But the sport needs new champions. One reason talk about Federer retiring has diminished is there is no reason for him to do so. Nothing makes a player feel older than getting beaten by players a decade or more younger than he or she is. That's when you start thinking about how you're getting too old for this crap. And right now, Federer is thinking he is still the right age. So who is the greatest of all-time? Whenever this question is asked, generally the response is - "Federer! Nadal" and "Excuse me, Serena is!" I'm not a big fan of comparing men and women against each other in sport. I don't think it serves any good purpose. I didn't watch the last Olympics and think, "Gee who is a better 100m runner, Usain Bolt or Elaine Thompson?" Karrie Webb is certainly Australia's most successful golfer of all time, but does that make her the greatest? It's one of those questions where if you answer "Yes", you are admitting a few caveats (ie she never beat any men), and if you answer "No", you are assuming being greatest automatically means being male. Serena might have more slams, but is she better? In what sense? Is Federer better? If so, is it not only because as a male he has inherent advantages that don't really go to who is the better "player" (whatever that means)? That Federer won last year after 6 months off after knee surgery was amazing, that Serena won while 2 months pregnant is unbelievable. But I have no idea which is the greater achievement, and I just can't see much worth in arguing either way. But I can understand people getting pretty damn annoyed when you see media orgs write that Federer is the "first person to win 20 grand slams". And I can also understand those who feel that the "Greatest of All-time debate" is always inherently about men. It's not hard to say "Greatest male player" or "Greatest woman player" and maybe that is where is should stand (not so good for the GOAT acronym though! ), and to be honest I'll often say Federer is the greatest of all time, just as I'll often say Serena is the greatest of all time without any gender adjective - such as I did here. It is hard enough to compare Federer with Nadal given Nadal's better head-to-head record, but Federer's better performance on non-clay (11-8 on hardcourt). There are three Masters events on clay, none on grass, would not Federer's head to head record be better were that not the case? On the women's side it is even harder to compare the three greatest of the open era - Serena, Steffi Graf and Martina Navratalova. Who played in the era of more depth? Whose record is better? Serena has 23 slam titles, but Steffi was number 1 for 55 more weeks than Serena has been, and she retired when she had just turned 30 - so Williams has had 6 more years than Graf, but been Number 1 for 55 weeks fewer? Does that make Steffi greater? Some days I think, yes, others I think no. One thing: Graf was amazing. I have long believed her to be the greatest women's player, but I now think Serena has just edged ahead (at least I think I think this). That Graf won all 4 slams 4 times, however remains an amazing feat (Serena has "only" done it three times - Fed and Nadal just once). The main reason I believe Serena is the greater of the pair is that I can't recall a time when she has not been favourite in a tournament. If she is there, she is the one to beat. That was not the case with Graf once Monica Seles came along (and to be honest has not been the case for either Federer or Nadal for large portions of their careers). But think on this, had Serena retired at the same age Graf did, we would be comparing two players one of whom would have won 9 more grand slams titles. That is astonishing. Good article. Why isn't this on the Guardian? It's not on the Guardian mostly because I wrote it on my day off! It's also a bit too long, it's perfect for my one blog post a year output here! Great stuff. I'm still a believer in old-school blogging about whatever takes your fancy! Bring back the Question Time columns!